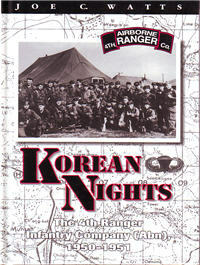 The 120-man 4th Ranger Infantry Company (Airborne) was one of the first of six airborne trained light infantry ranger companies in the Korean War. They were one of two ranger companies to make a combat jump during that war. They operated as part of armor-infantry teams, assault units and deep penetrating patrols. Follows the soldiers through peace-time billets to training to combat and casualties. 374 pgs, HB, 5.5ï¿½ x 8.75ï¿½, index, photos.